Drive straight until you reach Main street, then count three traffic lights, take a right at the fourth light that should be Highland street, then second light left into Summer street. But be careful as the street sign is hidden behind a tall tree. What? You missed the Highland sign? I told you – fourth light. 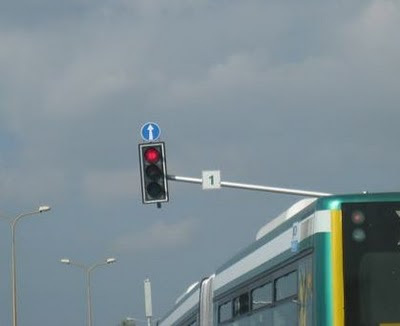 Now, you have to wait two lights, then you can do a U-turn. Remember: going South it will be a third light left into Highland. We all are too familiar with such navigation without a GPS in an unfamiliar area. Everything takes twice as long and requires twice the amount of concentration. 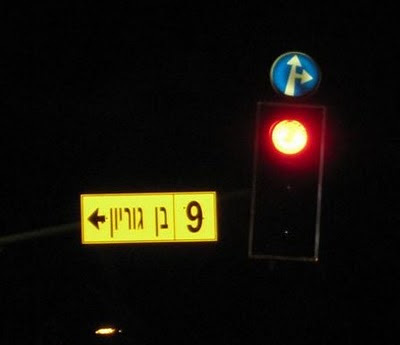 On our recent trip to Israel, we were thrilled to discover that this driving adventure is ingeniously simplified by assigning numbers to traffic lights. No need to count (by the way, do you count before, while or after you cross the light) to look for obscured street names. Just drive to the light numbered 7, take a right, drive to the light numbered 2 on the other street, take a left and you are there. 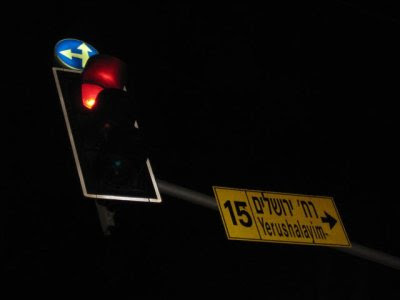 You may not always be able to read a long name like “Yerushalayim ave” but you will definitely notice the “15” above the traffic light. A little bit of simple math at every corner. That's great. I hope they do that too in other places for easier navigation, makes driving less complicated. If only drivers from all over the town understand this simple instruction then, it'll be not hard for us to manage and control all the road accidents. Also, I think drivers nowadays are just too careless to think about the traffic rules when they are out traveling. If only the traffic system in each and every nation have this kind of simple and understandable direction then, figuring out who's at fault will become easier. I note that drivers these days are quite complacent on what are their traffic duties while they are on the roads. i am so happy to share my testimony on how i was able to get back my ex lover around September 2015 with the help of Dr. Ofemo since 5 year ago, I almost gave up trying to get my ex lover back to commit to our relationship fully. I had tried the whole lot I knew, but what I DIDN'T know was that all I had to do was come to you Dr. Ofemo, and with your blessings and extraordinary magic powers, I wouldn't have to do all the work at all. you did your magic, and immediately after 24 hours, my lover came back to me with lots of apologies and flowers.. And now my life is balanced and happy again. Dr. Ofemo is a real and genuine spell caster he help me restore back my broken relationship. You do a great service to people, You are talented with spell to bring back ex lover and many more. Thank you for weaving your magic love spells for me. She is back just the way it was when we first met,his email address:drofemospelltempl@gmail.com it was all like a dream to me, i am so happy now as we are back together again thanks to Dr. Ofemo and i will advice anyone in need of help to contact him via email: drofemospelltemple@yahoo.com or his cell number +2348163387496 his web/site http://drofemospelltemple.wix.com/dr-ofemo. 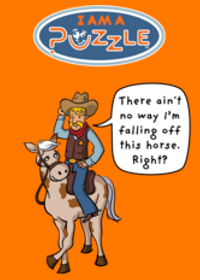 Many thanks for giving the helpful, healthy, explanatory not to mention fun guidance on this topic to Lizeth. I needed to create you one very little observation just to give many thanks the moment again on your remarkable advice you've documented in this case. It is strangely generous with you to give openly all that many individuals would have advertised as an e book to generate some dough for their own end, notably since you could possibly have done it in case you desired. The inspiring ideas likewise worked to become a easy way to be aware that other people have the same desire like my personal own to understand good deal more with respect to this problem. I'm sure there are several more pleasurable times up front for people who look into your blog. I enjoy you because of all of the hard work on this web page. Gloria take interest in setting aside time for investigations and it's easy to see why. Take pleasure in the rest of the new year. You have been doing a good job. You have been doing a good job. I must express some appreciation to you for rescuing me from this particular crisis. You're performing a glorious job. I needed to draft you this tiny remark in order to give many thanks the moment again on your pleasant views you've documented on this page. My personal honest apologies for not expressing appreciation to sooner. I am only writing to make you understand of the nice encounter my friend's child developed going through the blog. She came to find several pieces, with the inclusion of what it is like to have an awesome giving nature to make the mediocre ones without difficulty fully understand certain complex subject areas. Most likely you have never encountered all of us. Thank you so much for providing individuals with an exceptionally brilliant opportunity to read in detail from this blog. And of course, I am just actually contented with your tremendous secrets served by you. My very own honest apologies for not saying thanks to you earlier. A lot of thanks for your entire work on this website. Take advantage of the remaining portion of the new year. You have been carrying out a fabulous job. I intended to draft you the tiny note to finally thank you very much as before for those splendid solutions you've provided in this article. I just wanted to make a quick note to be able to express gratitude to you for some of the pleasant techniques you are writing on this site. I will not think twice to refer your web page to anybody who should get guide about this topic.